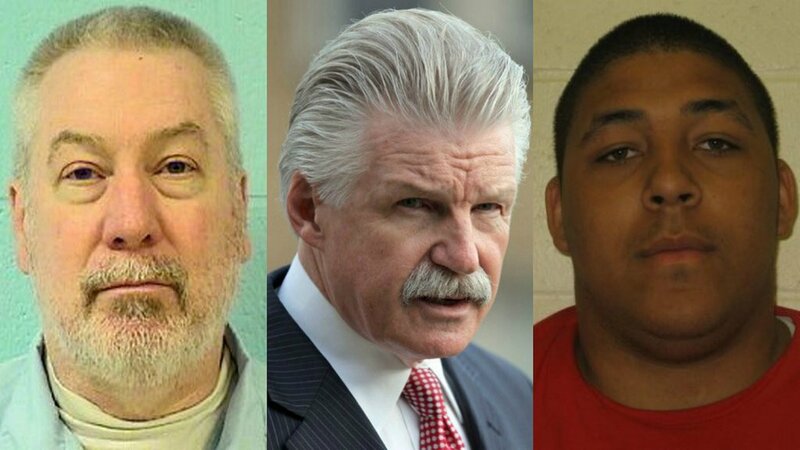 Some audio from Drew Peterson’s 2013 sentencing has been made public. These clips were played to the jury in Peterson’s solicitation of murder trial last month along with hours of prison conversations between himself and prison snitch, Antonio Smith. THE COURT: Go ahead, sir. PETERSON: Good day. My name is Drew Peterson. I hope I don’t aggravate the situation,but I have a lot of things that I think need to be said. THE COURT: Say whatever you choose. PETERSON: And I have been forced to sit silent since the beginning of all this. I did not kill Kathleen. THE COURT: Ma’am, I’d like you to leave the courtroom. Mr. Peterson, don’t make any outbursts which are calculated to irritate anyone in the audience. You are speaking to the Court now. PETERSON: I must have been woozy. PETERSON: Kathy’s death, it was never my intention throughout these proceedings, no one witness, no one juror, not one prosecutor looked me in the eye until today, and I hope Mr. Glasgow looks me in the eye right now; never forget my face; never forget what you have done here. Originally, I had some cute and funny things to end with but in closing now it’s time to sentence an innocent man to a life of hardship and abuse of prison, and I don’t deserve this. I don’t. Thank you. Read the transcript of his full statement. The jury has reached a verdict. Just waiting on Judge Brown to return to the courtroom. And the Verdict is…GUILTY on both counts of solicitation of murder and solicitation of murder for hire. One count carries a mandatory sentence of at least 20 years. The other at least 15 so he’ll get an addition 35 years minimum. Sentencing will take place July 26. This morning the prosecution has presented their argument to the jury and now it is the turn of the defense. 10:43 a.m. Back in session. Defense attorney Lucas Liefer up next. Liefer using the same words as Peterson, but applying them to SA Jeremy Walker. “The state has muddied the water so much in this case to distract you.” – Liefer to jury. “What are we left with? The recordings of a snitch. A career snitch who wanted to be an informant with the FBI.” – Liefer. Liefer pointing to James Glasgow’s signature to get an overhear order in Randolph County. Liefer talking about letters Smith sent to Gabriel and how Smith was told by FBI to keep his mouth shut. LIefer: Smith handed recording device to another inmate while on the yard. Liefer says it all compromised the investigation. Liefer playing recorded conversation between Smith and IA. Liefer says Smith wrote letters to Will County in Aug. 2014 because he was also snitching on correctional officers. Defense on Antonio Smith: If he was really worried about Peterson killing Glasgow, why did he wait months and months to tell authorities? Liefer points to “proof positive” that Antonio Smith was lying. Liefer asks if the state believed Drew Peterson about anything, why hadn’t they charged him regarding the drug trafficking plan. Liefer said state cannot point to one instance on recordings where #DrewPeterson asked Smith to “murder” or “kill” Glasgow. Jeremy Walker up for rebuttal. Walker: “Lucas and I are friends.” They go out to dinner and plan to get drinks tonight. “I didn’t put him away in prison for 38 years!!! And as mad as I am right now, I’m still gonna go have a drink with him…. Walker’s point: Liefer isn’t in prison for murder, and he doesn’t have another murder case pending against him. Walker: #DrewPeterson had four motives: Pension, appeal, Stacy, his son. Walker brings up media question regarding why Peterson was suspicious of staged photo if he wasn’t involved. Walker: Best line of #DrewPeterson trial came when Liefer asked Smith if you can believe a snitch. “You can with evidence,” Smith said. Walker is done. Jury getting instructions now.